Sun Peaks Pole Walking, or Nordic Pole Walking, is a fantastic European fitness activity that is quickly becoming popular in North America and is another Best Sun Peaks Summer Activity. And for a limited time, Sun Peaks and Discover Sun Peaks Adventures are offering free introductory sessions this summer at Sun Peaks Resort (and don't forget to ask for a 10% discount at our BestSunPeaks rental condo). 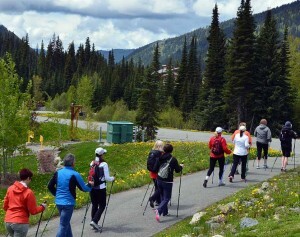 Nordic Pole walking not only gets you out and about exploring the beautiful valley trail system at Sun Peaks, it also provides a great, low impact workout with many benefits. Builds and strengthens your entire body, combining the ease and low impact benefits of walking with the numerous physical and cardio benefits of Nordic / cross-country skiing. Safely and effectively burns calories, improves cardiovascular fitness levels, and allows for low-impact workouts that are easy on joints almost anywhere and anytime. Learning to effectively use the required Nordic poles to engage all major muscle groups and get the most benefit is easy, and pole walkers can typically use their everyday shoes, runners or more specialized trainers if they choose. By combining the poles with walking, SunpeaksPole walkers increase their cardio, burn more calories, better align their body posture, more effectively build upper and lower body strength, and lowers joint impact over regular walking. And it’s sociable, fun, and part of a growing and popular activity! It gets you out and about in this beautiful, alpine paradise! These FREE introductory sessions go for 2 hours and begin at 10:00 am. Advance reservation is required and there is a nominal $10.00 rental fee if you need to rent Nordic poles (Keen Fit brand). Private or custom Sun Peaks Pole Walking individual or group instruction, tours and training programs can be arranged with fees to be determined. For more information or to register, complete and submit the form below, call Discover Sun Peaks Adventures at (250) 319-6064 or visit our friends at the Sun Peaks Adventure Centre. All for fun (and great exercise) and fun for all!